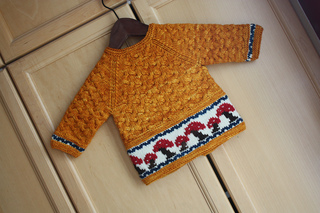 Please note that this pattern is part of a set that includes a Cardigan, Bonnet & Bootees. All 3 patterns come together. 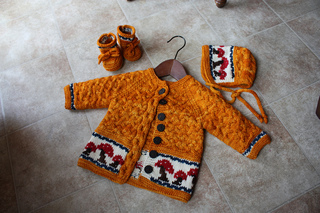 “Toadstools & Tadpoles” is a whimsical baby set including a cardigan, bonnet & booties. 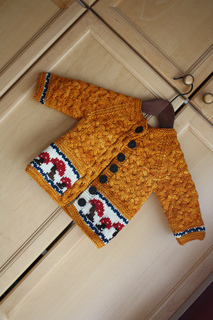 The cardigan is worked seamlessly from the bottom up with a toadstool border along the bottom (either done in intarsia or duplicate stitch), and a “tadpole” cable pattern on the body. A cable is worked at the same time, along the front edge and incorporates buttonholes. The bonnet is worked from the forehead to the back and then seamed at the back. 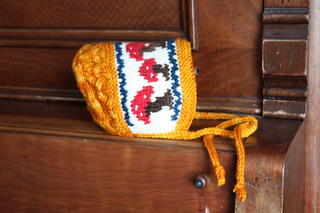 It features the tadpole cable pattern and toadstool brim as well as an i-cord tie. Please note that the bonnet in the photos is on upside down. 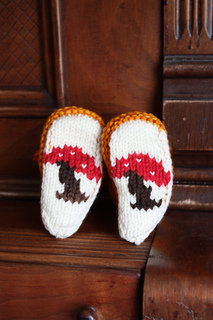 The booties are worked from the cuff down with a seam up the back. 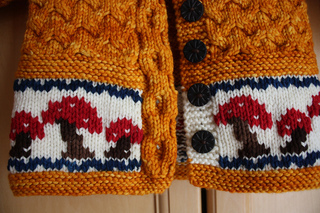 They feature a toadstool on each sole, blue border along the cuff and i-cord ties. Buttons from Eliza’s Buttons & Yarn, Barrie, Ontario.